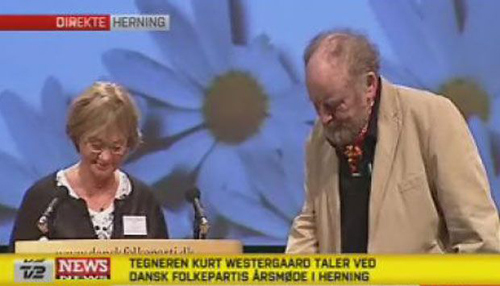 Today, Kurt Westergaard — the (in)famous cartoonist behind the most disputed cartoon/drawing of the 21st Century — delivered a speech at The Danish People’s Party’s annual convention. Westergaard’s appearance was a total surprise; even his bosses at Danish newspaper Jyllands-Posten weren’t informed (internal policy at Jyllands-Posten forbid its employees from participating in organized political affairs). According to several reports, Westergaard spoke of freedom of speech and of his experiences as a cartoonist on the run. The delegates and members of the Danish People’s Party cheered for Westergaard, as if he were one of their own. Westergaard himself stated that he “speaks his mind everywhere and anywhere” and added that nobody was going to tell him what to say and what to do. Personally I don’t believe that Westergaard subscribes to the nationalistic and deeply right-wing views of the Danish People’s Party, but of course there shouldn’t be anything preventing any moderate or left-wing person from speaking at a right-wing Party’s convention. However, I honestly don’t think this was a smart move on Westergaard’s part. I myself work as a cartoonist/illustrator/artist, and speaking as a professional, I think Westergaard’s stunt was utterly disappointing. I guess all cartoonists (or at least editorial or political cartoonists) have been extremely worried about the consequences of the Cartoon Crisis, and hoped that the infamous Muhammad Cartoons would be seen as a statement of principle, rather than as an overtly political gesture. Sure, Jyllands-Posten is indeed one of the strongest candidates for Danish equivalent to Fox News, but the newspaper’s cartoonists and journalists don’t necessarily share the views of editorial. In fact, Westergaard has spent a lot of time describing himself as a progressive modernist (in Danish: “kulturradikal“), but alas, all such endeavours by him seem totally wasted now. Although I consider Kurt Westergaard as a courageous and very admirable cartoonist and human being, and despite the fact that I deeply regret the sad, frustrating and unjust situation he’s been forced to deal with since the Cartoon Crisis exploded in 2006, I really, really, really think that fraternizing with Danish People’s Party is both unwise and extremely damaging to his cause — defending freedom of expression. Okay, the Danish People’s Party does support freedom of speech; or rather the freedom to deliver hateful and racist speech, but — really — Kurt, that’s not exactly what I expected from you. I expected you to stand clearly and firmly on the belief that editorial and journalistic integrity transcends muddy politics.